Haven't you noticed that I never repeat a key? I'll write twenty-four quartets, so as to have a complete cycle (Shostakovich: A Life Remembered, p 389). If he intended to write twenty-four and never repeat a key then it is pertinent to enquire in which order he intended to compose them. As we shall see this, in the phraseology of the mathematician, is a non-trivial question. The seminal work for a complete tonal cycle is Bach's 'Das Wohltemperierte Klavier'. This consists of two collections, BWV 846 to 869 and BWV 870 to 893, each composed of twenty-four preludes and fugues. In each collection Bach used the same simple system, based on semitones, to progress from one scale to the next throughout the cycles. He started with C major then selected, as the tonic for the next scale, the next note to the right on the keyboard thus placing flats before naturals, and naturals before sharps. Before proceeding to the next major scale he composed a piece in the same minor scale. This arrangement is shown in Table 1 where the right-hand column shows the number of flats or sharps in each of the scales. This system produces an "alphabetic" arrangement rather one than based on an orderly progression of flats or sharps. Between October 1950 and February 1951, Shostakovich composed his opus 87 as a tribute to Bach. Like Bach this work is a cycle of twenty-four preludes and fugues for piano, each piece being written in a different key. But he chose not to follow Bach's method for progressing from one key to the next, deciding instead on a slightly different arrangement. Shostakovitch also arranged the pieces in pairs but now each couple consisted of a major and its relative minor (that minor scale with exactly the same notes as the major). The first two pieces were in C major and A minor respectively; both of these scales have neither sharps nor flats. The third and fourth pieces were in G major and E minor, each of which has one sharp in its scale (it is actually C sharp). The two scales with two sharps were then employed for the following two pieces and this system, of adding one sharp, was continued until the thirteenth piece in F sharp major; a scale with six sharps. The next prelude and fugue was in E flat minor which has six flats. From then on scales were employed with flats but the number of flats was progressively decreased by one until the final two pieces were reached. These, written in F major and D minor, have only one flat (it being B flat). This arrangement is generated not by raising each tonic by a semitone, as Bach did, but by using the dominant (the fifth note in the rising scale) as the tonic for the next scale. Doing this will generate a major scale with one sharp more than those in the previous major scale, and then, after G flat major (which is equivalent to F sharp major) has been reached it, will decrease by one the number of flats incrementally. Finally Shostakovich, like Bach, placed the major scale before the minor. This arrangement, is shown in Table 2. In this table the first column shows the order of the piece Prelude and Fugues as it appears in the opus 87. Column 2 shows the scale in which the work is written whilst the next column shows the number of sharps or flats in that scale. Next comes an explanation how the next major scale is derived from its predecessor (remember the following minor scale is just the relative one of the major) , whilst the final column explains the change that has occurred in the scale from that of the previous pair. As can be seen Shostakovich's method of arranging the works is just as methodical as that used by Bach, and although it might at first sight appear rather miraculous it is based on elementary musical theory. The reason for giving such a detailed explanation of the tonal arrangement of the opus 87 will be understood when the scheme used in the fifteen string quartets is analysed. For the quartets Shostakovich appears to have selected a system similar to that used in the opus 87. 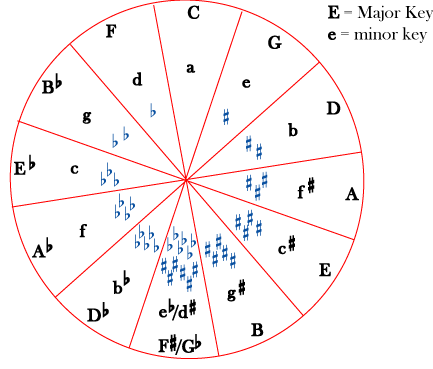 As we have seen, in the cycle for piano the dominant note of the major scale was used to generate scales with an increasing number of sharps and then a decreasing number of flats, each of which he then selected for a composition. For the string quartets he used the submediant note in the scale instead of the dominant note for this purpose. The submediant is the sixth note in the rising scale, and in any major scale the submediant note defines the tonic of the major scale's relative minor, that is the minor scale which uses exactly the same notes (naturals, sharps and flats) that the major uses. For example the scale of C major has no flats or sharps and thus uses only the white notes on the piano keyboard. The sixth note in this scale is A, and the scale of A minor (the relative minor to C major) has exactly the same notes in its scale as C major (the difference being, of course, that the scale starts on A and is played as a minor!) By generating scales using the submediant a cycle would contain pieces which first contain an increasing number of flats and then a decreasing number of sharps as is shown in Table 3. However Shostakovich then added cryptic complications into this scheme. Whether or not this was his aim, the first complication disguises his plan for the tonality of the quartets. What he did was that instead of using the submediant note to generate the next scale in an alternating succession of major and minor as is shown in Table 3, he first chose to use only major scales and only when they had been used did he start to compose in the minor scale. This first modification is shown in Table 4. In that table the first three columns reproduce the scheme already shown in table 3, whilst the fifth shows his scheme of using the key of column 3 first as the tonic of a major scale before it is employed in the minor. But in 1960 he introduced a second complication when he wrote his seventh quartet. Table 5 compares the tonality scheme derived in the previous table with those that he actually employed. As can be seen there is complete agreement up to, and including, quartet number six, but then two further modifications occur. The tonality of F sharp minor instead of E flat major is suddenly used for quartet number seven and then after correctly proceeding to C minor, E flat major follows instead of A flat major. Why this divergence? Both these alterations occur in the quartets dedicated to his wives. As can be seen in Table 5 these modifications however cause only a transient disturbance to the guiding scheme which Shostakovich seemed to have set himself when he composed his first quartet in 1938. From the tenth to his final fifteenth quartet he returned to, and faithfully followed, his original scheme. However because of the modifications started in 1960 the tonality of these last six quartets would, due to the insertion of the F sharp minor in quartet seven, always be one quartet in arrears compared to his original scheme. Can his deviation from his first concept be explained by certain tonalities associations with his first and third wives, or could it be more prosaic? Ian Strachan1 has proposed that the insertion of F sharp minor and the rotation of E flat major and C minor were done so that quartet number nine would be written in E flat major and quartet number sixteen in B major. (By doing so Shostakovich would ensure that his initials (DSCH) were used as the keys in quartets whose number are a perfect square (D major: quartet number four or 2 squared; S, in the German notation or E flat major in the English: quartet number nine or 3 squared; C major: quartet number one or 1 squared; and H or B major in the English notation as quartet number sixteen, or 4 squared). So it seems that Shostakovich, a tonal composer who delighted in keeping detailed numerical records of football scores2, indulged in numerical as well as musical ciphers.
. Ian Strachan, 'Shostakovich's DSCH Signature in the String Quartets' DSCH Journal, 10, (Winter 1998), 48-49.
. Laurel E. Fay, Shostakovich: A Life (Oxford University Press, 2000), p.111.